Mineralwater from Waterdispenser; sparkling or still. Self Service. For 4 people or more: Menu 1: 2-3 different kind of salads, 1-2 piece of cake. Possibility to get the quiche and the soup for an extra 3.50€ or Menu 2: SIGNATURE BOWLS; Burrito Bowl/Oriental Bowl/ New Avocado Bowl. Half Wrap per Person and Dessert. Coca Cola and apple fizz in small bottles. Self Service. 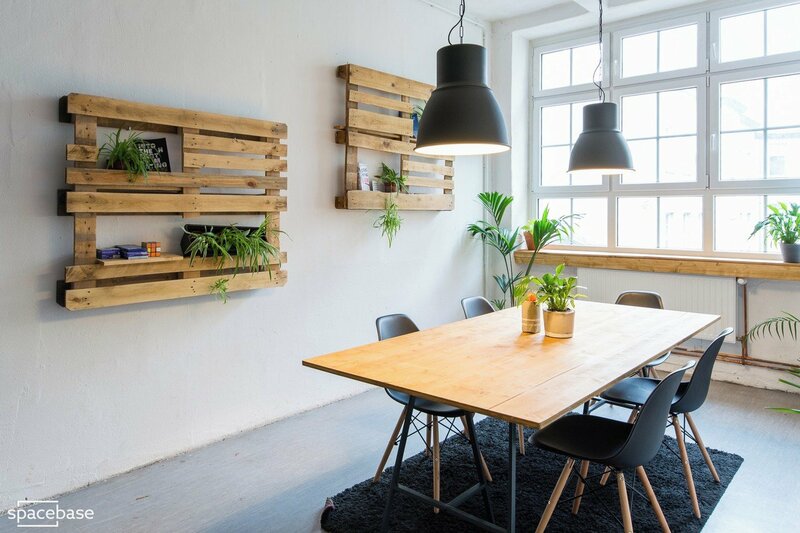 There are many meetingrooms in Kreuzberg to book, but this space is probably the best value for money you will find. It features a conference table and a large screen can be booked for a very small fee. As a sharing economy startup, we at Spacebase live what we preach and rent out our own meeting room. 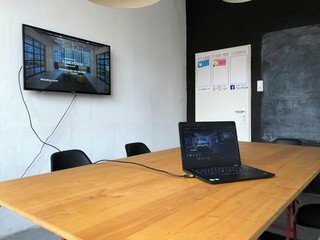 The venue is located in a typical startup office in the backyard of an old industrial building. While the outside looks rough, the room itself is warm and welcoming. When you book this meeting room in Berlin you have access to a simple equipped kitchen where you can help yourself to some drinks and snacks. Water is included in the booking, if you wish for any added drinks such as coffee or cold refreshments you are more than welcome to book them for a small extra charge. In addition, you can book breakfast, lunch or an afternoon snack. If you are interested, we would love to show you our whole office. We enjoy giving tips on what to see in Berlin. Especially for our favorite neighbourhood Kreuzberg with the relaxing Landwehrkanal we have many recommendations. In case you book the meeting room throughout lunchtime, you should take your time to enjoy one of the many restaurant around our office. IMPORTANT: Please bear in mind that you are renting only the meeting room, not the common area of the office. This room is not suitable for separate group activities. There is no parking directly at the location and no elevator. This bright and clean space is perfect for meetings, training workshops and and seminars of up to 10 people. The room is located in a quiet part of the building and just 100 meters from Görlitzer Bahnhof on the U1 and 3. Kottbusser Tor on the U8 is also a three minute stroll away where Alexanderplatz can be reached within 10 minutes. 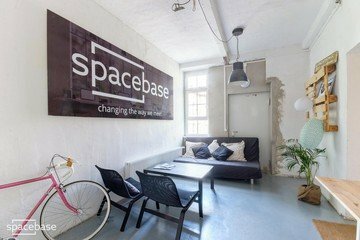 I would rate the surrounding of the meeting space only with 3 stars, especially the metro station Görlitzer Park, but the overall experience and the great staff at Spacebase allows a five star rating. Nice room, quiet, everything there and really nice host made it a success. Beautiful room with lots of light. Kitchen has everything you need. Can get a bit cold in the winter but the team is working on it as I was told. Would book again! Very good place, easy check in, plenty of light, nice enviroment, fast wi-fi: will book again for sure! What a great small Office, Ill come back! Cool space, solid introduction, I'm a fan. Bewertung sehr gut. Ja, ich werde den Meetingraum wieder buchen. Nice meeting room, perfect for 6-7, great area, charming Berliner Hinterhof Style. I'd book again. Everything was well organized. Ich bin sehr zufrieden. Die Buchung geht sehr schnell und bei Problemen wird mir sofort geholfen. The meeting room is nice, clean and has a good technical infrastructure. But ... the heating was not working, the staircase has looked very mouldy and in the meeting room next door, there was a mum with a crying baby (for hours). Especially the last fact has troubled our meeting seriously. Soft drinks out of opened litre bottles are disgusting. No coffee available. Neighbour room was rented for childcare. Perfect except the complete absence of environmental care. No recycling bin, everything goes in landfills. Coffee capsule are also very unsustainable. Other coffee machine exist. We are not in the 70s anymore, this is unacceptable. The space is very nice. The only big issue is the absence recycling bin, especially given the presence of wasteful capsule coffee machine. Great space. It was clean and easy to find. Der Raum in sich war sehr schön und sehr angenehm. Raumgesttaung auch ganz ok. Nur Flur war etwa beängstigend am Anfang. Für mich wirkte Spacebase sehr unprofessionell: keine genauen Anweisungen, wie man den Raum findet, per Telefon ist man nicht sofort erreichbar, plus keine Möglichkeit, Feedback von einzelnen Teilnehmern zu sammeln (da Anmeldung nötig). Meeting facility and handling was great. We would definitely book meeting space via your channel. Great place to have a meeting. Sometimes a bit loud. The room looked great and was spacious, I appreciated the access to water and a power strip. One slight problem was that the room was echo-y so I had a little bit of trouble hearing the people on my call. Next time I'll just be sure to bring headphones. Otherwise, the room was perfect. Wifi strong, nice room! Thank you! Water was paid for but not available?! Nice Location, very friendly staff, very good value for the price. This was a great space! The only reason I gave a low ranking in accessibility is because it is not wheelchair accessible or accessible for anyone who can't walk up 3 flights of steps. Also there is only one bathroom and between 2 meeting rooms there was a long wait for the bathroom. Other than that it was a great space and Adriana was amazing at ensuring everything went well. Thanks so much! Great space, could use more info on how to use the catering services. The space could be tidier. A great meeting room for the price. I would book it again anytime! The room was very nice. The welcome was warm. The room was well equipped and comfortable. I'd use it again. I was especially pleased to find a beamer in the room, which turned out to be very handy. Vielen Dank für den Raum! Ich fand es toll, dass ich sehr schnell (und sogar nachts) eine Rückmeldung und Zusage bekommen habe. Sehr freundlicher Empfang. Kleiner Minuspunkt: es war etwas kalt im Raum und ich wusste nicht, wie die Heizung funktioniert. :) Aber sonst tiptop, danke! Over all, a nice hipster X-berg meeting place. Easy access, a little bit messy in the kitchen/entrance, but we got a bottle of mineral water for free. Thanks! Perfect preparation, spacebase went the extra mile. Thanks! Great job, thumbs up! Pleasant room, facilities like bathroom, water boiler, glasses etc. available, simple and accommodating booking procedur - Thank you guys, I will definitely book the room again! Die Betreuung war sehr freundlich, der Raum war hübsch, aber leider etwas schmuddelig. Bright, modern gallery space in Berlin, Neukölln.